The Augusta Collection park benches liven up the landscape by combining contemporary design with modern functionality. The precision craftsmanship of the slim slat styled bench seat with back is supported by a laser cut frame that features sweeping legs and unique seatback accents. 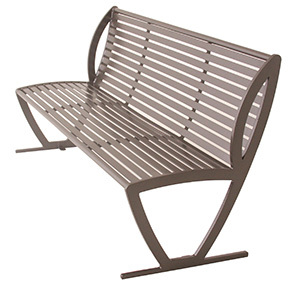 The superb style and performance is engineered with high-quality all-steel construction and ultra-resilient powder-coated finish, the Augusta Collection park benches are ready for indoor or outdoor applications. Built-in tabbed footings accommodate for both portable capabilities and surface mount installation. Offer an extra level of comfort with the available side and center armrests.